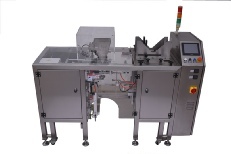 Automatic pouch loading, automatic pouch filling, equipment for filling pouches. Ideal for loading food products such as beans, pet foods, spices, rice, nuts, etc. into standup pouches. Both plain gussetted pouches, and zippered pouchs can be filled with this machine. • Speed up to 15 pouches per minute. • Color touch screen HMI. • 5 pound maximum weight for bag. The automatic pouch packaging system is controlled by an Omron programmable controller and Omron color touch screen HMI. Built-in help screens guide operators on screen use and features. Stored settings for up to 20 bag configurations can be saved and recalled for quick accurate changeover. Dedicated closed loop temperature controllers accurately maintains temperature set point for heat sealing jars.